Murray’s Cheese Bar | New York City. So many people we know—ourselves included—are fans of the Caprese salad. So simple but so delicious, the salad comprises slices of tomato and mozzarella with fresh basil, olive oil and balsamic vinegar. It’s named after the Italian island of Capri, where it was widely popularized in the 1950s following its “discovery” by tourists to the beautiful isle. It will be another month or more before lush, seasonal tomatoes make the Caprese a thing of glory. 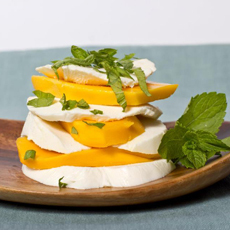 So in the interim, try a Mango Caprese, an inspiration of Murray’s Cheese Bar in New York City. Just substitute sliced mangoes for the tomatoes.